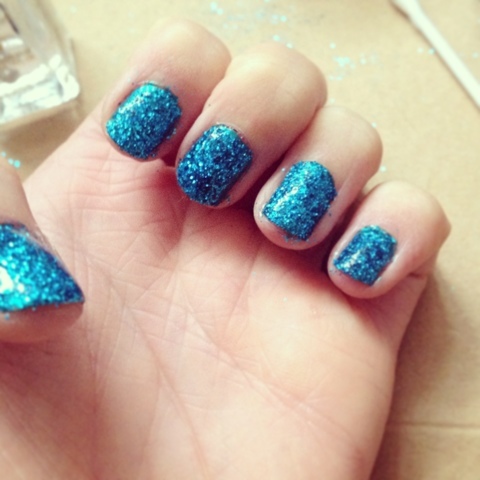 I fancied something a bit different and glittery with my nails so I went for a teal nail look. It's super easy and simple! I've not really ever used this nail polish before although I got it after Xmas in the Boots half price sale it's a beautiful colour it's by Henry Holland it was in a gift set so I'm not sure you can buy it separately... The glitter I got ages ago at the 2011 IMATS! It seems like only yesterday I went there but I'd absolutely love to go again it was defiantly amazing! The glitter is by NYX - 05 Summer Breeze, I don't think I'll ever ever ever use it all up. 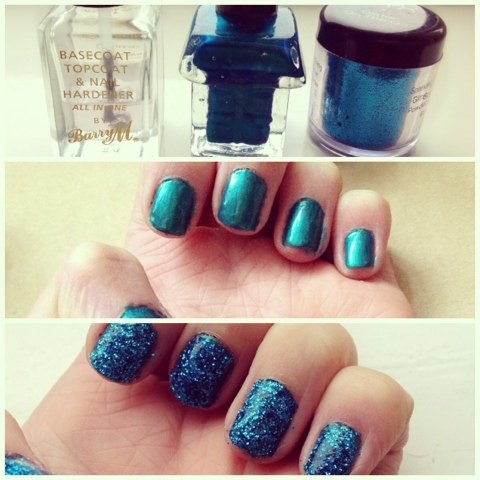 Step 5: apply 2 coats of top coat to seal in the glitter, it also helps give it a nice glossy finish.